Almost 50 million children living in conflict-affected countries around the world are being denied the chance of going to school whilst the number of reported attacks on education is rising. The number of reported incidents of children being stopped from accessing education, physically attacked or recruited by armed groups has increased sharply over the past year, after monitoring efforts were stepped up in the face of the deteriorating situation in Syria and concerns over girls’ access to education in parts of South Asia and sub-Saharan Africa. In our new report, Attacks on Education: The impact of conflict and grave violations on children’s futures, we document the impact of conflict on education, and include new research done for Save the Children by UNESCO’s Education for All (EFA) Global Monitoring Report (GMR) that finds 48.5 million children living in conflict areas are currently out of school, more than half of them at primary age. The conflict in Syria has contributed to the sharp increase in the number of reported incidents. Of more than 3600 incidents recorded in 2012, over 70%were in Syria. The new research comes as Pakistani schoolgirl Malala Yousafzai addresses the UN General Assembly in her first public speech since she was attacked by gunmen on her way to school in Pakistan last October. Of the nearly 50 million children aged between six and 15 out of school in conflict-affected countries in 2011, 28.5 million were primary school children, over half of them girls. 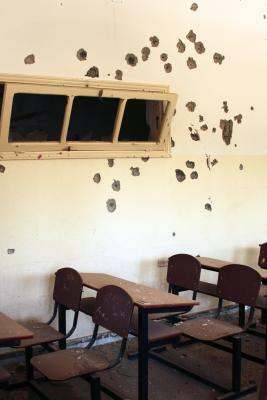 In 2012, there were more than 3,600 documented attacks on education, including violence, torture and intimidation against children and teachers, resulting in death or grave injuries, the shelling and bombing of schools and the recruitment of school-aged children by armed groups. Since the start of the Syria conflict, 3,900 schools have either been destroyed, damaged or are being occupied for purposes other than education. Despite the high levels of children out of school and the sharp increase in attacks, levels of funding for education in humanitarian emergencies remain shockingly low. Education funding has continued to fall from 2% of overall humanitarian funding in 2011 to only 1.4% of overall humanitarian funding in 2012, below the 4% that the global community has been calling for since 2010. Protect education by criminalising attacks on education, prohibiting the use of schools by armed groups and by working with schools and communities to adopt local measures to preserve schools as centres for learning –especially in a conflict. Cover the funding gap by increasing the current levels of humanitarian funding to education and progressively work towards reaching a minimum of 4% of global humanitarian funding.